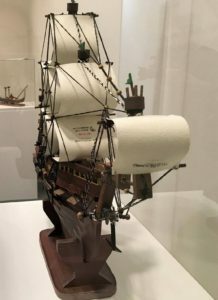 The military has decided that art made by wartime captives is U.S. government property and has stopped releases of security-screened prisoner art to the public. One attorney says the U.S. military intends to burn cellblock art. The new source of tension in the 41-captive prison is stirring a fundamental question: Who owns art? The state or the artist? 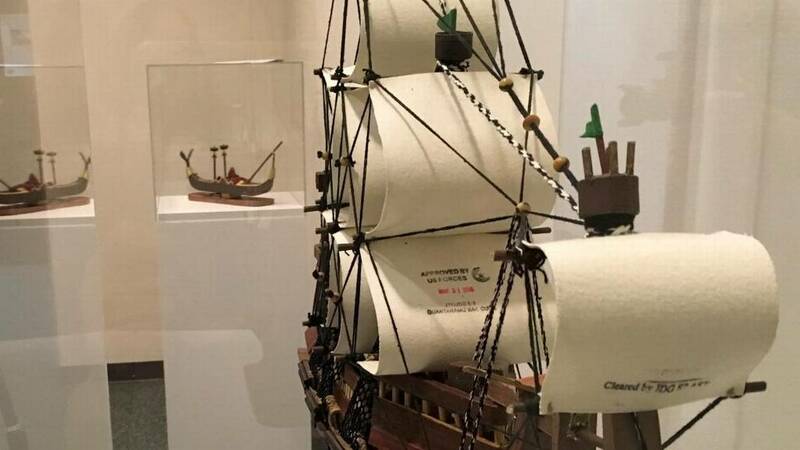 U.S. military officials declined to explain what caused them to abandon the years-long practice of releasing detainee art after inspection by prison workers schooled in studying material for secret messages under the rubric of Operational Security. The prison at Guantánamo Bay, Cuba, put its stamp of approval for release on the sail of this model ship built by Yemeni captive Moath al Alwi from paper and other found objects at the Camp 6 communal prison for low value detainees. 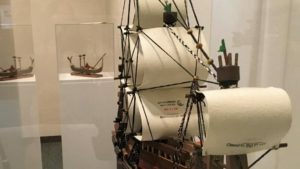 It was on display on Oct. 25, 2017 at the John Jay College of Criminal Justice as part of an exhibit of art made at the prison by captives past and present. Lawyers for the captives discovered the change in recent visits when troops at the 1,500-staff prison inexplicably stopped returning art that had been submitted for inspection and release. Then, according to two attorneys who represent several of the last 41 war-on-terror detainees, a commander told general population captives that they would no longer be allowed to give it away. Not only were the captives no longer to give their lawyers works of art as gifts, but the prison would no longer let the International Red Cross receive artwork for their families, the detainee told Jacob. According to that account, the colonel told captives the change was at the direction of someone not at Guantánamo. An ICRC spokesman had no comment, and invoked the confidential nature of the humanitarian organization’s contacts with the U.S. administration. In contrast, Federal Bureau of Prisons policy lets its inmates mail “arts and hobbycraft” to family, give them to certain visitors and sometimes display it in public space, if it meets the warden’s standard of taste.